Complexity has met its match! Today, organizations are grappling with ambiguity, volatility and paradox surrounding the challenges they face. This is complexity. Dealing with complexity successfully demands the involvement of a diverse group of people, diverse knowledge and understanding, and the engagement of all stakeholders towards implementing solutions. 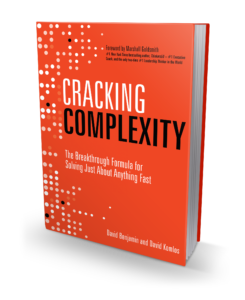 Now, for the first time, the authors share their revolutionary method for unravelling and addressing complex challenges in mere days, not months, not years. Theirs is a sophisticated process with its origins in cybernetics and systems-thinking which has been refined over three decades through their work with some of the world’s leading companies. David Komlos is the CEO of Syntegrity. For more than 20 years, Komlos has worked with senior leaders of global companies across the Fortune 500 to help them bring fundamentally different approaches into the mainstream. He works across industries and sectors including financial services, life sciences, automotive, entertainment, governments and NGOs. He is actively involved with Syntegrity’s clients, and as a speaker, he frequently presents on complexity, problem solving, mobilization, and scaling talent. 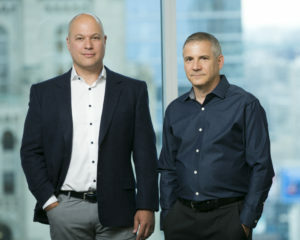 Prior to Syntegrity, Komlos was responsible for leading strategy and M&A for North America Media Engines Inc., a TSX-listed company. He holds an MBA from the Schulich School of Business, and a Bachelor of Arts from the University of Toronto, Canada. David Benjamin is Chief Technology Officer and Chief Architect of Syntegrity. Benjamin leads Syntegrity’s client delivery organization and its Lab, and is accountable for the overall design and quality of the company’s client engagements. His career has spanned a variety of industries in roles at IBM and smaller specialized consulting firms, with particular emphasis on business system design and technology development. He has gained significant formal recognition for his work on global strategic planning with top executives in Fortune 500 companies. Benjamin holds a Bachelor of Mathematics (Honours, Co-op) degree from the University of Waterloo, Canada.